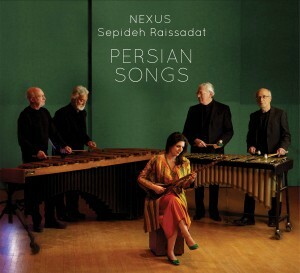 August, 2015 – I’m happy to announce the newest CD by NEXUS – “Persian Songs” (NEXUS Records #10926). The group’s 16th CD under the “NEXUS Records” label features classical vocalist, Sepideh Raissadat, performing arrangements by NEXUS member, Russell Hartenberger. A live performance of “Persian Songs” by NEXUS will be a featured event at the 2015 Percussive Arts Society International Convention in San Antonio, Texas from November 11 through 15. For inquiries about purchasing this CD, or for more information about this and other CDs by NEXUS Records contact Bill Cahn (billcahn@aol.com). Welcome to the NEXUS site!